When word broke that beloved childrens horror novels Goosebumps were coming to the screen courtesy of Gulliver's Travels director Rob Letterman, the world held its breath; surely the movie would fail to do justice to the wonderfully spine-tingling and pulpy nature of the stories that inspired generations of young readers? As it turns out, we needn't have worried. 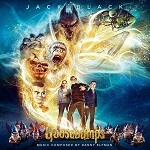 In collaboration with star Jack Black, the director has fashioned a funny and affectionate, if not especially scary, celebration of the Goosebumps brand, one that unleashes a host of monsters upon suburbia including werewolves, giant insects and one seriously malevolent ventriloquist's dummy named Slappy (a classic villain from the novels and voiced by Black himself). Given the nostalgic air of the movie itself, one that hearkens back to a fondly remembered era of 1980s Joe Dante and Steven Spielberg hits, it's perhaps inevitable that the same level of affection carries over into the score by Danny Elfman. In its own way, the score is something of a homecoming for the composer given he first exploded onto the scene with memorably manic, darkly comic works Pee Wee's Big Adventure and Beetlejuice, to which the enjoyably madcap Goosebumps score is indebted. Elfman is therefore an inspired choice of composer and his signature voice only serves to enhance the movie's impact. The score sets out its stall early doors with the gleefully malevolent "Goosebumps" main title arrangement replete with a host of bouncy brass arrangements, a woozy theremin, percussion, choppy strings and amusingly portentous choir. It's quintessential Elfman and perfectly tailored to the tone of the movie; one can almost imagine the music accompanying a fairground ride or haunted house. The theme is rarely heard to its fullest extent but deconstructed versions of it are used to represent the storyline's more monstrous inhabitants, whether it's the mock- rumbling piano arrangement in in "To the Rescue" or the full-bore Gothic stylistics of "Ice Rink" and ‘"Capture", which really open the taps with brass, strings, snare drums and choir. Everything calms down to an extent in the charming "Ferris Wheel", a musical representation of the suburbia that's about to be blown apart by the supernatural menace; Americana horns, winds and strings mix with more propulsive rhythms to reflect the ebb and flow of daily life (something Jerry Goldsmith always did brilliantly in his scores for Joe Dante). It also introduces the tender romantic theme for the burgeoning relationship between central characters Zach (Dylan Minnette) and Hannah (Odeya Rush), one that attains more fulsome gravitas in the charming "Camcorder", the poignant "Confession" and, especially, the haunting trio of "Ghost Hannah", "Hannah's Back" and "Farewell" (where the score evokes the spine-tingling atmosphere of Elfman's masterpiece Edward Scissorhands, although it never quite gets there). "Slappy" and "Slappy's Revenge" introduce what could be described as the central villain's theme, a menacing yet darkly comic progression for the brass section that captures the devious dummy's personality perfectly. As the ringleader of all the Goosebumps mayhem that unfolds, Slappy's theme works its way through the anarchic action material of "Bus Escape", "Lawn Gnomes" (the latter featuring some wonderfully mischievous pizzicato strings) and "Mantis Chase", all of which are orchestrally robust yet falling just on the right side of scary. With the soaring yet whimsical finale of "They're Here", "Farewell" and "Credits", during which time Elfman wraps up all of his principal ideas, one might assume that the score has come to its end. However it's only halfway done, as due to a thoughtful bit of album presentation a whole host of additional material has been included in the form of bonus tracks. The glowering brass/tinkling xylophone combination of "Something's Wrong" and "Break In" could have come straight out of Edward Scissorhands' darker moments, whilst "Champ" introduces some enjoyably tongue-in-cheek material for actor Ryan Lee's wingman character, pizzicato strings and dainty woodwinds working in tandem. "The Books" is one of the most significant of the bonus tracks, accompanying the pivotal scene where Zach and Ryan first stumble across the Goosebumps manuscripts and unwittingly unleash the supernatural menace; tinkling xylophone, snaky strings and undulating theremin build into an impressive choral climax, the music again resplendent in the familiar Elfman textures from the likes of Charlie and the Chocolate Factory. 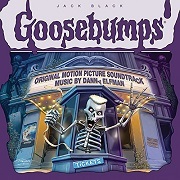 It's a testament to Elfman's dramatic skills that, for a comedy score, Goosebumps still has the capacity to excite and create a sense of danger whilst falling down on exactly the right side of dark. But then this is a composer who has always had a love of the bizarre and twisted, beginning with his collaborations for Tim Burton and continuing with the rest of the scores mentioned in this review. Elfman's offbeat sense of humour and his ability to translate said humour into musical form is not to be sniffed at, and it's put to excellent use in the Goosebumps score, one that fits the movie like a glove whilst functioning as a solid, stand-alone listen. For all his experimentation over the last few years in the realm of documentary (Standard Operating Procedure) and low key drama (Silver Linings Playbook), it's thrilling to see this singular musical voice back on home territory where he belongs.